Now watch any movie, be it bollywood masala or intense hollywood, first day first show. Because now you can book movie tickets online and make big savings on your booking as well. Go and start using online ticket booking portals such as PVR Cinemas, Fast Ticket, Big Cinemas, TicketNew, Book My Show and many more. These movie ticket site offers amazing discounts to all the users. Offers where you can get buy 1 ticket and get 1 free, or deals on various debit and credit cards, or 50% off on the next ticket booking. So what are you waiting for, just go on a movie date now! Verified on 22/4/2019 .. Book Vunnadhi Okate Zindagi, Thor: Ragnarok, ITTEFAQ, Geostorm, PSV Garuda Vega, Golmaal Again, Raju Gari Gadhi 2, Adirindi, Raja The Great, Secret Superstar, Mahanubhavudu, Spyder, Lego Ninjago and more movie tickets online from TicketNew and make payments with ICICI net banking and get flat Rs 125 instant discount. Offer is valid on minimum purchase of Two movie tickets and minimum transaction value of Rs 300. Each customer can avail the offer only Twice during one month. Use ICICINET movie code to avail this offer. Before it goes expires get all latest movie offers today. Book Now! Verified on 22/4/2019 .. Book 2 or more movie tickets at BookMyShow and get up to Rs 125 discount, or 50% off on the total transaction value, whichever is lower. 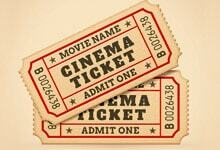 A minimum of 2 movie tickets needs to be purchased online in order to avail the discount. The offer can be availed once per user during the offer period. This offer is applicable for both old and new users online. You can also book from various cities like Hyderabad, Bangalore, Mumbai, Kolkata, Chennai, Delhi and lot more cities. Hurry up! Book your tickets today. Verified on 22/4/2019 . Book Bollywood thriller movie ITTEFAQ tickets at PVR and make payments via PhonePe and get 50% cashback up to Rs 125. Cashback is valid for 1 transaction per user using PhonePe wallet. Book it now. Hurry Up! Verified on 22/4/2019 . October is a romantic entertainer film which is going to be released on the coming Friday. Book with Easy Movies and get tickets at best price. You can also book from Hyderabad, Warangal, Vijayawada, Kakinada and Rajahmundry cities. Book it today. Hurry Up! Verified on 22/4/2019 .. Book your favourite movie Raja The Great, Secret Superstar, Raju Gari Gadhi 2, Blade Runner 2049, The Lego Ninjago, Chef, Nenu Kidnap Iyanu, Spyder, Bhoomi, Jai Lava Kusa, Simran, Mahanubhavudu, Veedevadu, Newton, Srivalli, Haseena Parkar, Kathalo Rajakumari, Kingsman: The Golden Circle and many more movies at Justickets and pay via Mobikwik wallet and get upto Rs 75 supercash. Valid for old and new users. Hurry! What are waiting for? Book your movie tickets and get this amazing discount offer. Book it today. Verified on 22/4/2019 . Book latest movie tickets online at PVR Cinemas and get 50% cashback upto Rs 125 on payments via PhonePe (UPI, Cards) during the offer period, on PVR website or App. Cashback is valid on 1 transaction/per user using PhonePe during the offer period. Cashback will be credited into your PhonePe wallet within 24 hours of successful completion of the transaction. Terms and conditions apply. For more details visit PVR Cinemas offers page. No PVR offer code required. Book now. Verified on 22/4/2019 .. BookMyShow presents buy one and get one free tickets for all the Citibank Debit Card users. This is applicable only on Citi Priority, Citigold & Citigold Private Client World Debit Card. Please go through terms and conditions at the lading page and avail this attractive offer. Minimum of two tickets have to be booked per transaction to avail the Citibank movie ticket offer. No Book my show code is required. Book now. Verified on 22/4/2019 .. Avail flat Rs 150 discount on all your online movie ticket bookings. Coupon code is STEALDEAL. This coupon is applicable on all the movies and valid for both old and new users. You can also watch the official movie trailer online, you can book from various cities like Bengaluru, Chennai, Delhi/NCR, Hyderabad, Kolkata, Mumbai, Pune, Gurgaon, Ahmedabad and lot more cities but limited to selected citites only. You can also book from various show timings like 11:30 AM, 02:30 PM, 06:30 PM, 09:30 PM and many more shows. Hurry up! Book today. Verified on 22/4/2019 . Get flat 10% cashback up to Rs 200 maximum on all your movie ticket bookings. Apply MOVIE200 offer code at check out page and avail this cashback. This offer is applicable to both old and new users online. You can also book your favourite movie tickets from various theatres like Cinepolis, Cineplex, Asian Cinemas, PVR Cinemas and many more from various show timings as well. You can book from various cities like Hyderabad, Chennai, Bangalore, Mumbai, Noida, Pune, Kolkata, Delhi and more cities. This offer is applicable on all the movies. Check more details on the landing page. Use Paytm movie offer code and get cashback. Grab this limited deal today. Hurry Up! Verified on 22/4/2019 .! Now book your online movie tickets at BookMyShow and make your payments through RBL bank credit or debit cards and get up to Rs 100 off on all your online payments. This offer is applicable for 15 transactions per user in a month. No special coupon code is required to avail the discount. Get to the landing page to avail this wonderful offer! Verified on 22/4/2019 . Book your movie tickets Adirindi, C/O Surya, Angel, Detective, Thor: Ragnarok, PSV Garuda Vega, Okkadu Migiladu Next Nuvve, Ittefaq, Vunnadhi Okate Zindagi and pay using Paytm wallet and get flat 25% cashback up to Rs 60. Select the offer on the order confirmation page and complete the payment through Paytm wallet. Valid for both new and old users. Grab this limited period offer today. Hurry Up! Get flat 50% cashback on best movie offers at Nearbuy. Here look on to the landing page where you can get cashback vouchers of PVR cinemas and INOX. No Nearbuy movie promo codes required to get this offer. Offers to start at just Rs 500. Grab this limited period offer today. PVR Cinemas offers buy 1 ticket and get 1 ticket absolutely free online movie ticket bookings. This offer is applicable only on the tickets booked for saturday movie shows. This offer is valid only on the payments done through Kotak Mahindra Bank credit card/ debit card/ net banking as well. There will be a quota of maximum 400 free tickets on every Saturday available under the offer. Each Kotak Customer can avail up to 2 free movie tickets per month. Kotak Customer can avail the offer by booking tickets for Saturday's show. This offer is valid across all cinemas listed at www.pvrcinemas.com except PVR director's cut, PVR gold class, PVR IMAX, PVR mahagun & PVR opulent. This offer is not valid on Kotak best price card, Kotak travel agent card & Kotak corporate card. The customer will have to pay the convenience fee as levied on each ticket. Book it today. Verified on 22/4/2019 .. Flat 50% discount on PVR snack combos exclusively on BookMyShow website and app. Select the movie, show and PVR cinema of your choice. When you reach the Booking Summary page and add your discounted PVR combos and get the discount. No BMS offer code required to grab this offer. Get it today. Hurry Up! Verified on 22/4/2019 .. BookMyShow and Payzapp wallet together are offering an exciting deal just for you. Book your movie tickets online through Payzapp wallet payment and get 50% discount on ticket price max up to Rs 100 cashback. Use MOV50 offer code and get cashback. This offer is valid only on a mobile app and. This offer can be availed one time. Click here to get it now. Book it today. Hurry! Verified on 22/4/2019 . Book your favourite comedy and horror movie Anando Brahma tickets online at PVR Cinemas and get flat Rs 50 instant fiscount (Use PVRNEW50 offer code). Valid for new users and applicable on a min transaction value of Rs 500. Valid on PVR website and App. Hurry! Book your movie tickets now. Verified on 22/4/2019 . Book movie tickets for any movie and get 2 free movie tickets per month or Rs 500 off whichever is less using SBI signature credit cards. This offer is valid only for SBI signature credit card customers. A user can avail this offer once in a month and only on purchase of minimum two movie tickets. Pre book your movie tickets from various theaters like Asian GPR multiplex, Cinepolis, PVR Cinemas, Cine Town, Cineplanet and lot more. You can also book from various places like Chandigarh, Jaipur, Chennai, Bangalore, Hyderabad, Nagpur, Mysore, Goa, Surat and many more. This offer is valid only on the primary card. To know more about SBI Signature Card please SMS “WAVE” to 5676791. Book now. Verified on 22/4/2019 . Paytm movies offers today for Delhi users. Buy one get one free all movie tickets at M Cinemas in New Delhi. This coupon code is applicable for both old and new users online, and valid only for New Delhi customers. Hurry up! Book your movie tickets online now. Verified on 22/4/2019 . Get flat Rs 100 cashback using Jio Money wallet on BookMyShow. Offer is valid on a minimum transaction value of Rs 100. Offer is valid for transactions done on Friday, Saturday and Sunday during the offer period. Each customer can avail the cashback only once during the offer period. The cashback will be credited in your Jio Money wallet within 4 working days from date of transaction. No movie offer code required. Book now. Verified on 22/4/2019 . Book Mersal movie tickets at PVR and make payments with PhonePe wallet and get 50% cashback upto Rs 125. Cashback is valid on 1 transaction (per user) using PhonePe during the offer period. Cashback will be credited into your PhonePe wallet within 24 hours of successful completion of the transaction. Book now. Verified on 22/4/2019 . Book (3D) Blade Runner movie tickets at PVR Cinemas online and get 50% cashback upto Rs 125 using PhonePe wallet payments. Book now. Verified on 22/4/2019 .. Book IT movie tickets online at PVR Cinemas and get upto Rs 125 SuperCash, make payment via PhonePe wallet and get this offer. Offer is valid for both old and new users. Cashback will be directly credited into a PhonePe wallet within 24 hours. No Pvr offer code is required. Book now. Verified on 22/4/2019 .. Book VIP2 movie tickets at PVR Cinemas and get flat Rs 50 instant discount(use PVRNEW50 code). Offer valid for only on first transaction (new users) per email id and mobile number. and on a minimum transaction value of Rs 500. This offer is valid on PVR website and App. Book from various cities like, Kochi, Mumabi, Delhi, Hyderabad, Bengalurum, Chennai, Surat, Kolkata, Vijayawada, Mohali, Pune, Mangalore, Lucknow and more. Hurry! Book your movie tickets today. Verified on 22/4/2019 .. Book Shubh Mangal Saavdhan movie tickets @ PVR Cinemas and get flat Rs 50 instant discount (Use PVRNEW50 discount code). Valid for new users only, applicable on a min transaction value of Rs 500. This offer is valid on PVR website and App only. Hurry! Book now. Verified on 22/4/2019 .. Now you can watch all latest movie trailers at Easymovies. Choose from various movie trailers like Spyder, Jai Lava Kusa, Mahanubhavudu, Bhoomi, Simran and many more trailers are available. Watch for free. Verified on 22/4/2019 .. With BookMyShow, Get 30% discount on movie tickets with your Digi bank. Flat 30% discount is available on both website & mobile app bookings. Make your online payments using Digi bank debit card, credit card or net banking. You can book from various theatres like Inox in Kolkata, Cinepolis in Kukatpally, PVR Cinamas in Forum mall, Asian Cinemas in Inorbit mall, Sky walk in Chennai, Ampa theatre in Chennai and lot more. No promo code is required to avail the discount. Book now. Verified on 22/4/2019 .. Book movie ticket at Justickets and make payments with Amazon Pay wallet and get 25% cashback upto Rs 50 on Amazon Pay Balance. Select the offer in the order confirmation page and complete the payment through the Amazon Pay Balance. Verified on 22/4/2019 .. Upto 50% cashback (up to Rs 125) on payments via PhonePe (UPI, Cards) during the offer period, on PVR website or App. Payment to be made through UPI, Debit Card or Credit Card within the PhonePe option on PVR checkout page. For users paying through UPI, cashback will be valid only if the transaction is processed through "@ybl" VPA handle or through PhonePe linked bank account or complete the transaction within the PhonePe app. Cashback is valid on 1 transaction (per user) using PhonePe during the offer period. Verified on 22/4/2019 .. Book Annabelle: Creation movie tickets online at PVR Cinemas and get flat Rs 50 discount. Offer valid for both old and new users and applicable on a minimum transaction value of Rs 500. Valid on PVR website and App. Book from various cities like, Hyderabad, Delhi, Vijayawada, Bengalurum Chennai, Kochi, Mumabi, Mohali, Pune and more. Use PVRNEW50 discount code to avail this offer. Verified on 22/4/2019 .. Book Bareilly Ki Barfi movie tickets online at PVR Cinemas and get flat Rs 50 instant discount(Use PVERNEW50 code). Applicable for both old & new users and also valid on a min transaction value of Rs 500. Book tickets through PVR website and App and avail this offer. There are movie buffs of all kinds! Whether its comedy, romantic, drama, epic, detective, horror, psychological thrillers and other movie genres – each genre has its audience! If you love all these genres or a few from the mix, then it is evident that you might be checking what’s on the theatres and multiplexes on a weekly basis, waiting to watch the same over a weekend or a week day within your budget. So when it comes to booking the movie tickets, where do you go to get the best deals? On HappySale, we present you with an array of online movie ticket booking websites that provides you with the best deals and discounts. You simply need to search using the movie tickets offers option and select from the deals listed for you. So start browsing now! With the latest online technologies and apps, the world is becoming more advanced than ever with every passing day! All that you want is available online – from information to a movie ticket. Therefore, when you have the option to be seated within the comfort zone of your house and browse through the online movie ticket booking apps and select the movie ticket/s and also activate a discount offer and save on the same, it’s a smart call to opt in for it. Furthermore, the modern day life is a busy one where everyone is pressed in for time. So to balance all errands and chores and also get your movie tickets on time and within your budget, it’s best to purchase the same online. Majority of us love to meet our friends over weekends or a Friday, and watch movies that are a common choice. Every week there are new releases and the price of the movie tickets are always fluctuating. So to be able to opt in for the best movie tickets online in a hassle free way, you can simply count on the movie tickets offer codes in HappySale and select from the offers provided by various brands and add to your savings! There seems to be a perception that booking movie tickets online and opting in for the latest movie tickets offers is a complex task and needs to be done carefully. Though we agree on the “being careful” part, but the process is a rather easy one. All you have to do is browse through HappySale and then check out the various offers provided by various movie ticket booking portals. When you finally select the offer that fits your movie preference as well as your budget, all you need to do is click on the “show code” option and you will get a code that you must use when you are making the payment. It is here that you will be able to redeem your discount percentage. When you are browsing through HappySale for the best and the latest movie tickets offers you will come across several brands providing you with excellent deals, namely – PVR Cinemas, BookMyShow and the like. Other discounts from brands include names like Inox and Big Cinemas that have designed the deals and offers in a way that there’s something for most audience to browse and select. So browse through the deals and select the movie you want to watch, the number of tickets you need, the type of seat you want and get the same within a price that is pocket friendly. Whether you decide to watch a movie solo or with a friend, you always have an attractive offer to count on. Other than providing you the best movie ticket booking portals like PVR Cinemas and BookMyShow, when you use the movie tickets offer codes listed in HappySale you also have the chance to pay using your digital wallet, such as Mobikwik, Freecharge and Paytm and get some of the best discounts in terms of cashback offers. For instance, in Freecharge you have the chance to get a 50% discount on your first transaction. This means, you can watch your best movie in half the price. There are other best cashback offers by Paytm and also customers who pay through SBI, MasterCard, Citibank, ICICI and HDFC Bank cards. So ditch the long queues outside the multiplexes and book your movie tickets online to save more. If you have been waiting to browse and select from the best, latest and the authentic movie tickets offers of the day, stick to HappySale as this portal brings you the best deals that are pocket-friendly!